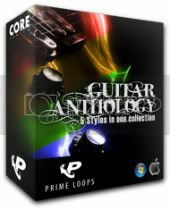 Guitar Anthology is a genre-busting collection of 5 sample packs in one bumper package… you also get a bonus free chords pack which is completely exclusive to Prime Loops. All sounds are clearly labelled with tempo and key info, and you can choose from Wav, Rex2 Loops, Apple Loops, MPC, Ableton Live Pack, Acid Loops, or whichever you prefer! *Prime Loops currently have a 25% sale on ending December 31st 2009.